On March 26, 2018, Singapore-based ride-hailing firm Grab announced its latest acquisition - Uber's business in Southeast Asia. The deal is the largest-ever of its kind in the region. This marks Uber’s third major overseas retreat, following similar ones in China and Russia. Once SoftBank, an existing backer of Grab and several other Uber rivals (including China's Didi Chuxing, and India's Ola), made clear in August 2017 its intentions to fund Uber, many speculated that a merger between the two companies was imminent. "Today's acquisition marks the beginning of a new era," said Anthony Tan, Chief Executive Officer of Grab. "The combined business is the leader in platform and cost efficiency in the region." "This deal is a testament to Uber’s exceptional growth across Southeast Asia over the last five years. It will help us double down on our plans for growth as we invest heavily in our products and technology to create the best customer experience on the planet. We’re excited to take this step with Anthony and his entire team at Grab, and look forward to Grab’s future in Southeast Asia," said Dara Khosrowshahi, CEO of Uber. Grab (founded in 2012) is currently present in 195 cities in eight Southeast Asian countries (Singapore, Malaysia, Indonesia, Philippines, Vietnam, Thailand, Myanmar, and Cambodia) and offers the widest range of on-demand transport services including private cars, motorbikes, taxis, and carpooling services, in addition to food and package delivery services. On Uber's official blog, Khosrowshahi stated, "One of the potential dangers of our global strategy is that we take on too many battles across too many fronts and with too many competitors. This transaction now puts us in a position to compete with real focus and weight in the core markets where we operate, while giving us valuable and growing equity stakes in a number of big and important markets where we don’t." Kindly note, In this exchange (strategic retreat), Uber will take a 27.5% stake in Grab. Uber CEO Dara Khosrowshahi will join Grab’s board. However, the statement did not disclose the value of the deal between Uber and Grab. Grab will integrate Uber’s ridesharing and food delivery business in eight countries in the region into Grab’s existing multi-modal transportation and fintech platform. With the combined business, Grab will drive towards becoming the #1 online-to-offline (O2O) mobile platform in Southeast Asia and a major player in food delivery. 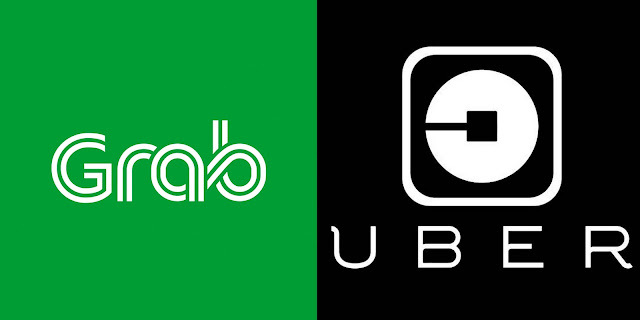 To minimize disruption, Grab and Uber are said to be working together for migrating the Uber drivers and riders, Uber Eats customers, merchant partners and delivery partners to the Grab platform. The Uber app will continue to operate for two weeks to ensure stability for Uber drivers, who can find out how to sign-up to drive with Grab online. Uber Eats will run until the end of May (2018), after which Uber delivery and restaurant partners will move to the GrabFood platform. Why Grab? Why not Uber? Grab has always kept optimizing its app as per the local conditions, whereas Uber’s app remained largely unchanged from the one it used in the U.S and other markets. For instance, Grab let passengers text drivers via a chat feature within the app with in-built automated translation feature. For passenger's safety, it also masked rider's phone numbers from drivers, and in Singapore, it let users input convenient numeric codes for nearby taxi stands in lieu of addresses. But the most important point is about the margins on rides hailed across Southeast Asia, which are likely very low. Rides in Bangkok starting as low as 218 baht (approx. $7) for UberX and in Manila (Philippines) its start at 189 pesos (approx. $3.50). In short, Uber commission earning from the rides were always wafer-thin. And at the same time, Uber is also taking the heat in the form of high marketing expenses, required to keep up with Grab. It is a no-brainer, Uber faced a long road before it could see sustainable margins (if not the profitable ones) in the region comparable to what it can earn in American cities with higher starting fares. Even in the United States, the company is not yet profitable, as Khosrowshahi noted in November 2017 - "The U.S. is very, very competitive right now between us and Lyft, so I don’t see the U.S. as being a particularly profitable market for the next six months,", who made the comments at the last year's New York Times DealBook conference in New York. Uncertainty, of course. This particular deal is touted to disappoint just not the passengers of the region but also going to increase the woes for the drivers who are used to Uber's generous incentives program. In the very recent past, When Uber departed China, Didi quickly slashed its driver bonuses and the number of available cars on the road shrank considerably in all major Chinese cities. By eliminating the competition in the region, it is quite clear, in coming few months the earnings (including decent incentives) will become tougher day by day for the drivers.